"In 2004 we built our new 4-bedroom house in North Epping. Energy costs weren’t a concern at the time, so we included lots of downlights, gas heating, air conditioning and an electrically-heated outdoor spa that ran all year. Rising energy costs hit us really hard in 2011 when we received a quarterly electricity bill for over $900. Gas costs also rose significantly about that time, so when a friend mentioned he was getting good results from a solar panel installation he’d just installed we looked into our own options. He was happy with his supplier, MV Solar, and in late 2011, after getting two other quotes, we went with our friend’s recommendation and chose MV Solar to install our first array of solar panels and an electrically-boosted solar hot water service. We also adjusted our spa to heat only during hours of peak solar energy and started selling electricity back to the grid. This cut our energy costs dramatically, and as the costs of gas and electricity rose steadily from 2012 to 2016 we felt ‘protected’ and were able to simply not worry about our energy usage. We could use our air conditioner in summer and know that it cost us nothing during those hot, sunny days. But we also could work out the greater benefits of adding battery storage to our system for even better financial outcomes, especially in autumn and winter. So in late 2016 we upgraded our system with additional solar panels and a battery storage unit, combined with a Catchpower solar diverter that is a more efficient way of using the solar power generated to heat water for our home. Since then, we haven’t looked back. As everyone else seems to be complaining about rising energy costs it’s not a worry for us. Our power costs are small, and could be even less if we wanted to be more efficient with our usage of dishwasher, washing machine, etc. But as it is, we enjoy affordable power bills and electricity whenever we want it. Our home is cooled in summer and warmed in winter without generating any expenses, and we’ve even gone through a couple of electricity blackouts in our neighbourhood without having the lights go out. Since 2011 MV Solar has been our energy consultants and we’re happy with the results. Their recommendations have worked out well for us and we feel like we’ve been ‘out front’ of the big shift to household solar installations." "It took me a year to find the right company, who I felt comfortable enough to trust with my house. It was not a matter of finding the cheapest quote, but a combination of high quality workmanship and equipment. The information provided was understandable and not too technical. It showed expertise and experience, that proved to me that I was in good hands. I can highly recommend MV Solar to anyone who values high quality work without compromise or cutting corners." "I chose MV Solar because I was looking for the most reliable system, not the cheapest. The staff at MV Solar were thoughtful and attentive to my needs during the consultation phase, guiding me through the entire solar installation process. They even submitted paperwork to my energy provider for a digital meter. This was suprising - I didn't expect this to be done and removing this step saved me a lot of hassle. I'm extremely happy with my newly installed system and I confidently recommend MV Solar to interested parties. There is a level of trust which you just don't receive with the majority of solar installers." "As you know Michael was a personal friend of my husband so we would not have used anyone else for our solar installation. I think we were one of his first clients in Sydney. The panels were installed in 2011. So saying after local friends saw the quality of the installation they proceeded to use MV Solar to install their solar panels. The work done by Michael and team was first class and the panels and inverter are still working well. Everything was installed in an efficient and professional manner. When we had problems with the inverter in the initial year they were very quick to replace it under warranty. When I had a problem with the trip switch in the power board Tim came out promptly and fixed the problem. Since then the system is working very well and my power bill has been cut significantly even with the poor feed in tariff from the electrical company. To have an electricity bill of less than $200 in mid winter with heating going full bore is fantastic, and that is without a battery." 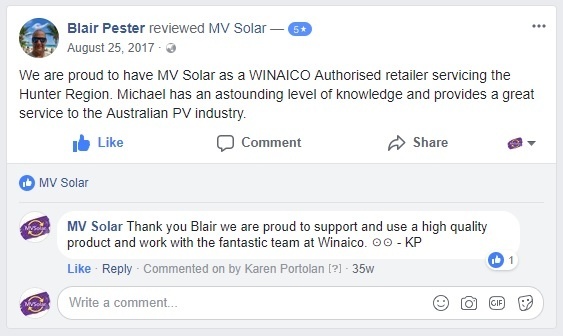 "Appreciation and thanks to all the team at MV Solar, from initial consultations with Kerry Gilbert, right through to installation and connection in December 2016. The new solar system upgraded an existing project, requiring some integration, and we took the opportunity to upgrade the switch and circuit board, all coordinated by MV Solar." "A big thank you following our most recent electricity account. This is the first account since increasing our system to 24 panels and adding a Blue Catch system. Admittedly it is the lowest bill of the 4 during the year, however the total was only $137, including over $100 in daily supply charge. Our hot water component reduced to only $18 which is a reduction of over $100. I should add that our household has 4 adults using the power." We have learned to be smarter with our electricity use which also helps, but being able to monitor our usage using the Blue Catch is of great assistance in reducing our bill. Seeing the big reduction in our greenhouse gas ‘emissions’ is a feel-good bonus." Again, a big thank you to all at MV Solar. Please ensure that Micheal and all the team read this message." “I am extremely happy with the solar system installed by Michael and his guys at my place. The installation is extremely professional, and they cleaned up after they completed their work, leaving the place as they found it. Michael explained the inverter/system to me once installed. I found this invaluable as it helped me understand how it works, and the outputs it was generating. He also organised for the system to be connected to the grid in a timely manner. I found the whole experience easy, as it was like a “one stop shop”, as they organised the application, supply, installation and connection to the grid for me. Very happy overall”. “We installed a large system and were very pleased with the prompt installation over 2 days. We are happy with the quality of the equipment and for the assistance with the administration issues like finance, government rebates, and renewable energy credits”. “Michael Valantine of MV Solar installed 9 panels in May 2010. On our recommendation, friends of ours have also installed systems and we have upgraded our system this year. We have no hesitation in recommending his knowledge and workmanship”. "I approached MV Solar after hearing about them from a friend for the installation of a solar battery system. I couldn’t be more happy with the system or the professionalism shown by this company from quote to install to after sales follow ups truly great team to deal with." When the panels were being installed the teamwork between the men was very professional, and the clean up was carried out in a very efficient manner. Barry found the experience with MV Solar very informative and he is happy with the output of his system. "Tim and Liam installed the solar yesterday, nice job, very professional service thank you. Again could you pass my thanks onto your tradesmen, they’re certainly expert in their field, lots of info and handy tips I wasn’t aware of." “Since 2008 MV Solar has supplied and installed three solar power systems on our property, Goulburn River Stone Cottages. We have found Michael’s depth of knowledge and skill very impressive, all work was completed to a high professional standard, with close attention to safety. He also provided excellent after sales service and advice if and when required”. “MV Solar were engaged by Rig Installations to supply and install Solar Electricity generating systems in early 2011. 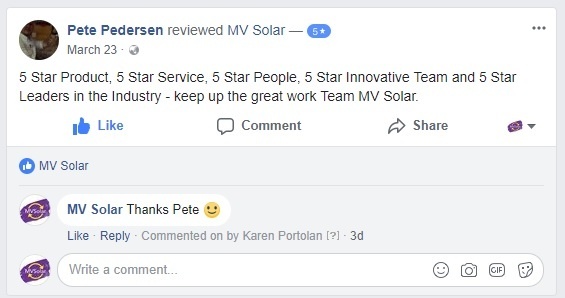 Throughout the entire project the management and staff of MV Solar worked to the highest standards and kept us up to date on the progress at all times. This well trained, experienced and courteous team were a pleasure to work with. I recommend them to anyone contemplating a Solar Farm”. “Michael and his team were very professional in their planning and installation of a solar system. I am happy to recommend MV Solar to anyone contemplating the installation of solar panelling”. John Day requested a system check in March 2014, in the after service follow up call he said he was quite satisfied with the service and that any time he wants advice or help with his solar system he calls MV Solar. “I was indeed fortunate in sourcing the services of MV Solar. I found them to be very competitive and extremely efficient. Michael Valantine has extensive experience in solar energy and after one year of operation I remain extremely happy with our installation”.